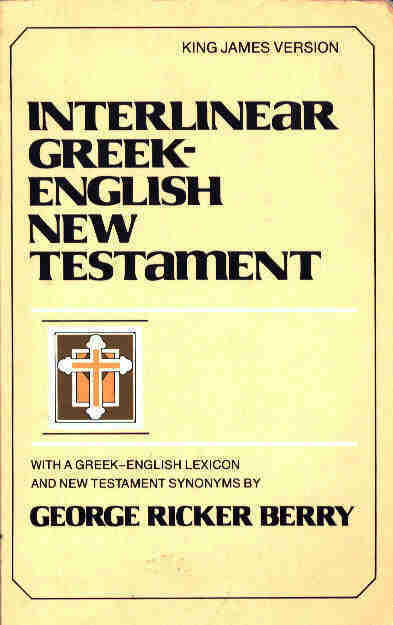 Following is the original Greek text of 1 Timothy 4: 1-5, from the Interlinear Greek - English New Testament by George Ricker Barry, Phd, (reprinted 1995 by Baker Book House from original edition, 1897, Hinds and Nobel) with the word to word, Greek to English translation under the Greek -- and the King James rendering to the (right) side. The words shown in brackets, [ ], are the words or concepts added in the license, judgment, directive and /or prejudice of the King James' philosophers / translators and are (as you can see) NOT found in the original Greek writing. Notice the change in perception or sense as the translators inserted the verb [bidding] to the phrase "to abstain from meats," thereby overriding and negating the original Greek's verb: "forbidding" which was the verb intended to the act upon that dependent phrase "to abstain from meats", as it does act on the phrase: "to marry" preceding it. So in the original text, understood by a learned Greek reader, is Paul's warning against those persons persuaded by deceiving spirits, influenced "in hypocrisy of speakers of lies, being cauterized their own conscience" as those who will be, those "forbidding to marry," as well as forbidding (not: [bidding], not: commanding) to abstain from meats? Now compare DC 49:18-21 (or original paper DC 49:18-21 of April 12, 1995)and notice the correct original Greek meaning appears perfectly matched in the correct inspired understanding of Joseph Smith's heaven dependent, sensitive writing! In the rest of 1 Timothy 4, an experienced Greek reader will also notice the subtle but opposing shift from the sense of protective acceptance, respect, and reverence for all God's creatures "sanctified" by Him, as is shown in the original text -- to the English translators implication that God is giving His approval here for man's receiving for killing and consumption of them. Both the original 1 Timothy 4 and DC 49 are not licenses to destroy and consume the animals! but are God's divine license for those who choose "to abstain", and His protection from, as well as His condemnation of those who would forbid abstinence! This King James shift (influencing our own convenient understandings) is an example of serious translation error that can enter into a translation processes, functioned in the personal prejudices, mindsets, experience, choices, directives or intent of the translators and their employers, as well as our own, much too easy, willingness to unquestioningly accept it! In this single translational error, the critical human health choices and consequences, our creature relationships, humane and human reverence, and the compassionate path of all Christianity has been radically skewed, betrayed and degraded with this subtle insertion and reversed meaning of one single verb!